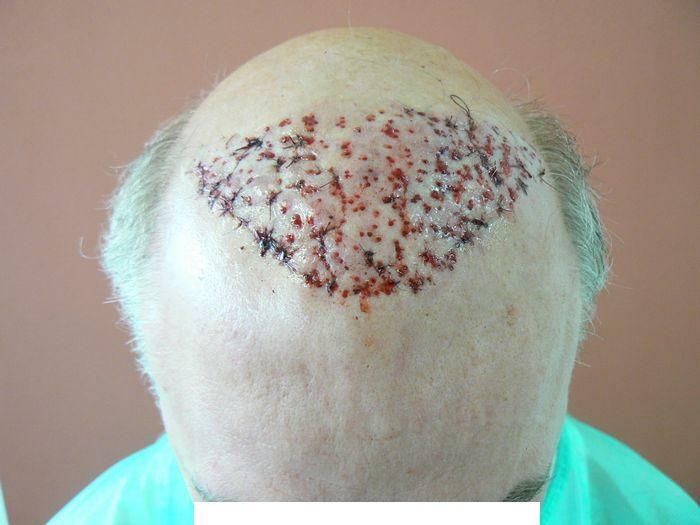 This is a case you do not see every day and the patient has allowed me to post. 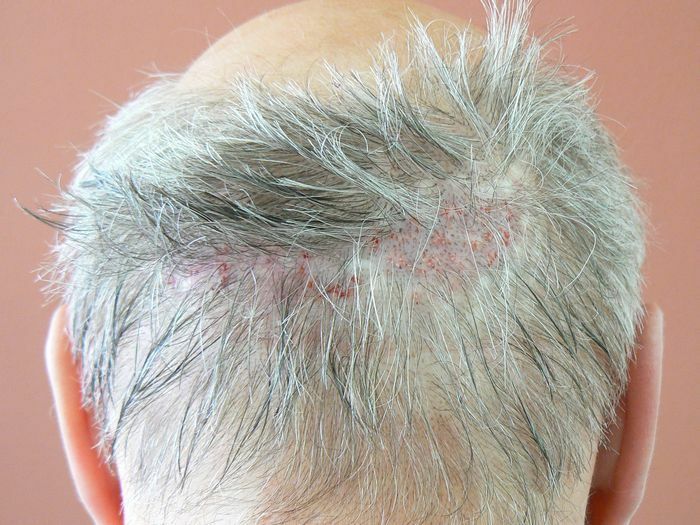 Our Patient had old punch grafting in the '70’s and then a smaller revision strip to try and hide some of the large grafts on the hair line that was not really that successful. He came to us with obviously a great deal of uncertainty and apprehension about results and expectations, we discussed the possibility to extract more from his donor to camouflage the old work or to reverse the procedure. 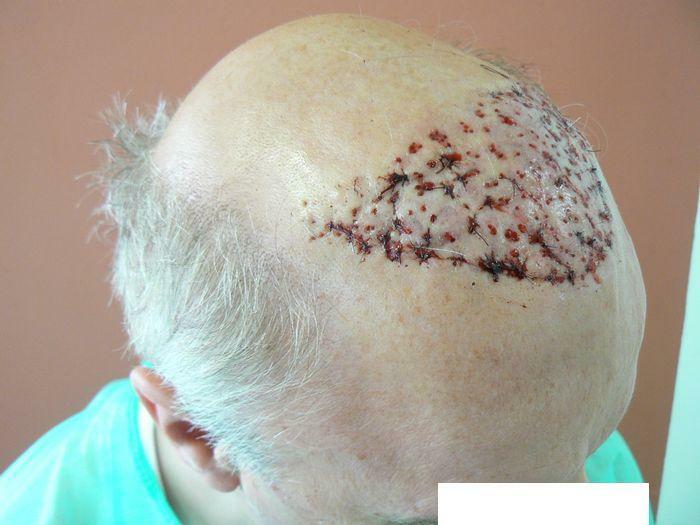 After checking his donor density and scarring it was obvious that to take any more hair would not be recommended and leave the donor too thin, either by Strip or FUE, taking in to consideration the grafts needed and the amount of scarring that existed. It was agreed to do a small test, approx. 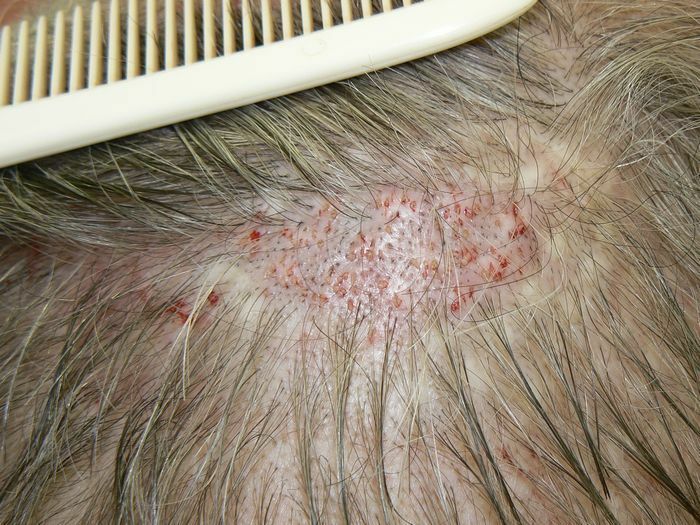 10 plugs being removed on the hair line and then assess the healing, pitting and ridging or scarring that was left. 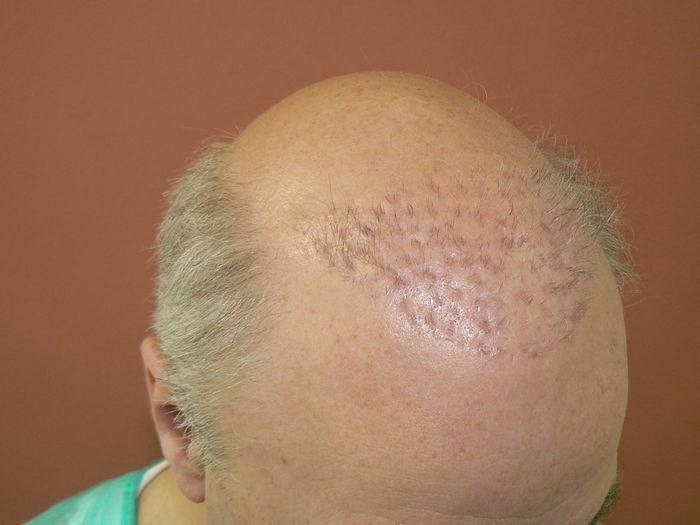 This was successful in respect the grafts were removed and even the patient said he could not see any scarring. The pictures below are the culmination of that, we have now removed 327 plugs and placed as many as we could back into the donor scarring. 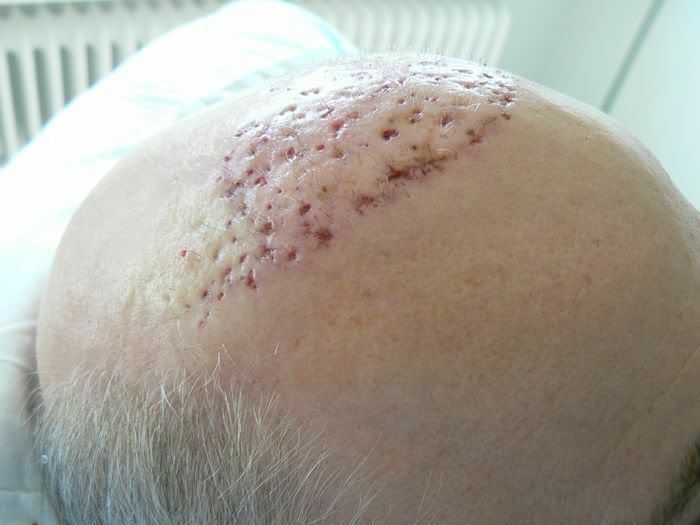 The plugs were either removed via FUE or sutured depending how large and how close together they were. Ouch, it looks very painful. 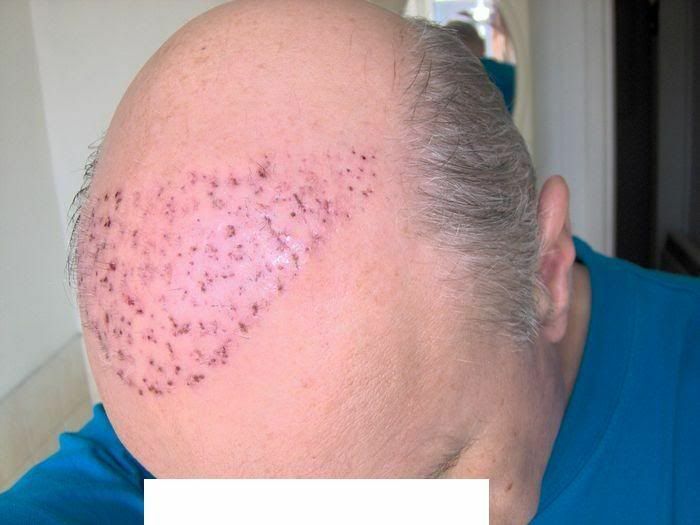 Horrible, good lesson for all of us, there is always a chance that we will lose more hair after a hair transplant and all we have remaining is an island of hair. Why are his plugs so red after all these years? 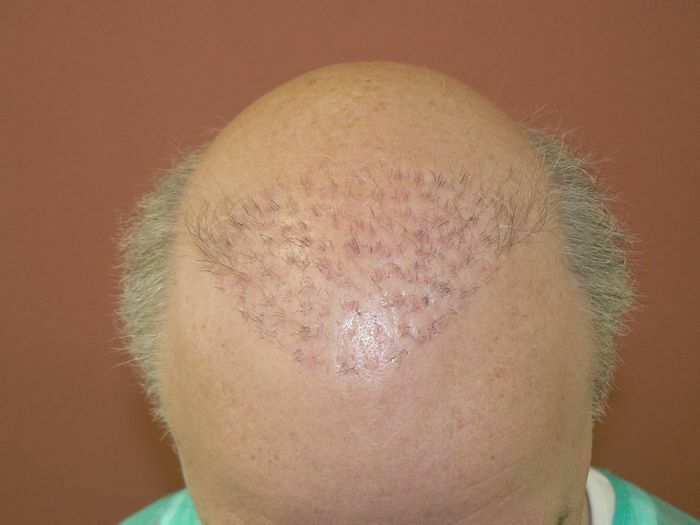 When you look at the total thinning age brings on, the “permanant” donor hairs may still lose 80% of their density. That means 80% of the transplanted hairs that look so good now… will be lost! Our patient is not a member of this forum. "Hi Plug here, first of my thanks to Phil, Dr Bisanga and the staff, sorry wish i could remember all the names but all were freindly, professional and Phil and Chris were very re-assurring. Phil is a mine of information and assurance and Chris (Dr) just comes across as a Doc who is completely confident and absolutely knows what he is doing. I had two areas that bothered me. 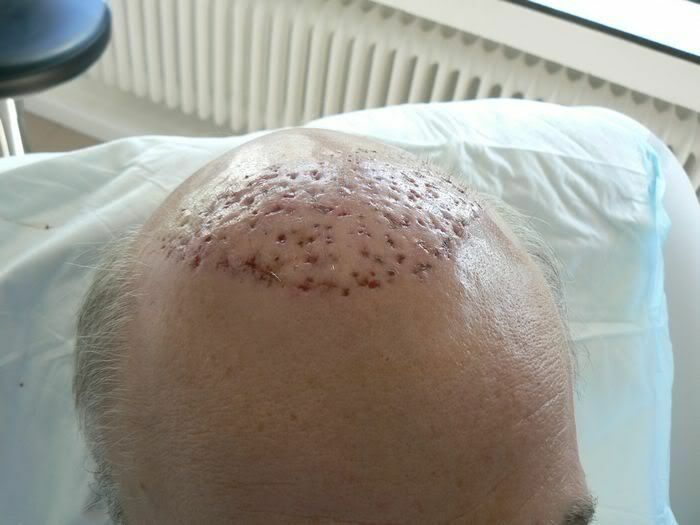 The plugs on top and the open hole donor scarring at the back. 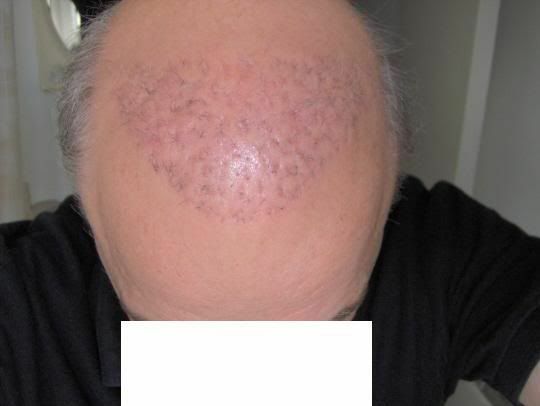 It doesn’t show that much in photos but the donor scarring is extensive and if shaved down is more obvious. The recipient plugs bothered me the most. If I shaved you would see a crescent area filled with pits and ridges. If I cut it short you see what you see above. 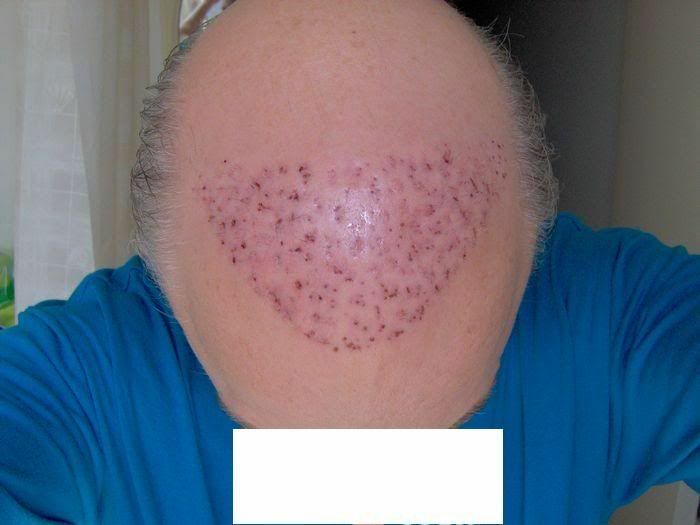 if I grew it, you saw an island of pluggy grafts. So from my point of view I had nothing to lose. The plugs had to go, there will probably still be some ridges and pits left behind but i’m hoping that the removal will help to even that out a bit. I am certain that it will still look better than the plugs. Secondly I may as well have the redistribution to the donor holes in the hope that it will partially improve that area. I know that it will not make a huge difference due the huge area to cover and the unpredictable success rate with this into scar tissue, but every little helps in my opinion, and what esle am I going to do with the excised plugs other than throw them away. 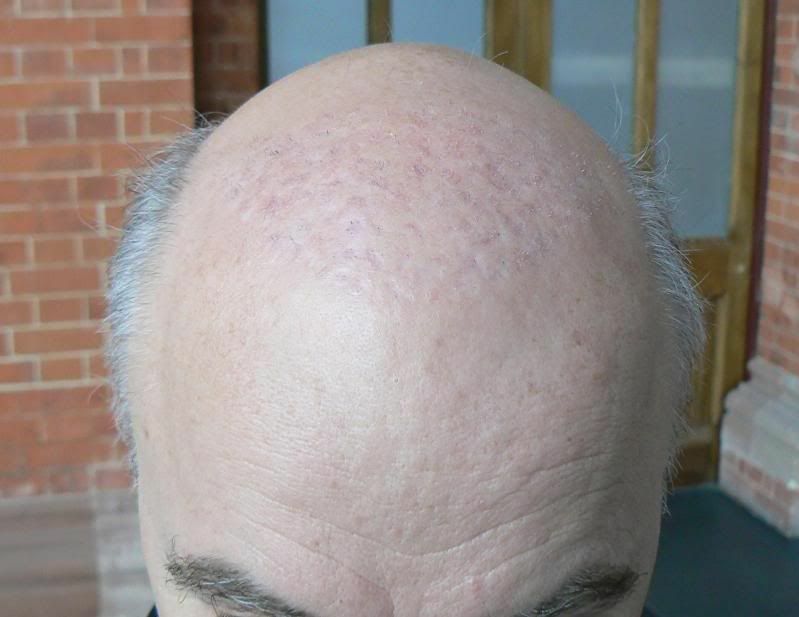 Anyway, after two days, its already beginning to heal, have slight swelling around the forehead but no pain. 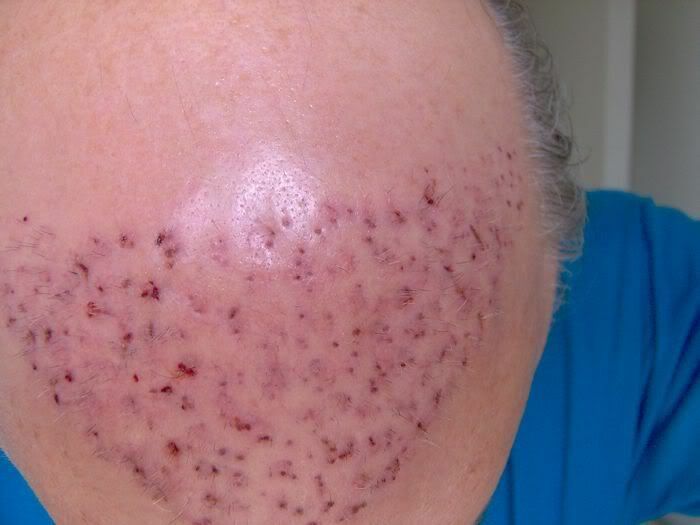 For the future, depending on how well this turns out, I may look into laser resufacing, fraxel, or other methods to address hyper pigmentation and any remaining pitting and ridging. But its early days yet I’ll just get through this first and take it from there." He will be returning in a few days for his suture removal and I will update then with how his healing is going. » Our patient is not a member of this forum. » completely confident and absolutely knows what he is doing. » filled with pits and ridges. If I cut it short you see what you see above. » update then with how his healing is going. Hi, Plug came to see us a couple of days ago for his suture removal. 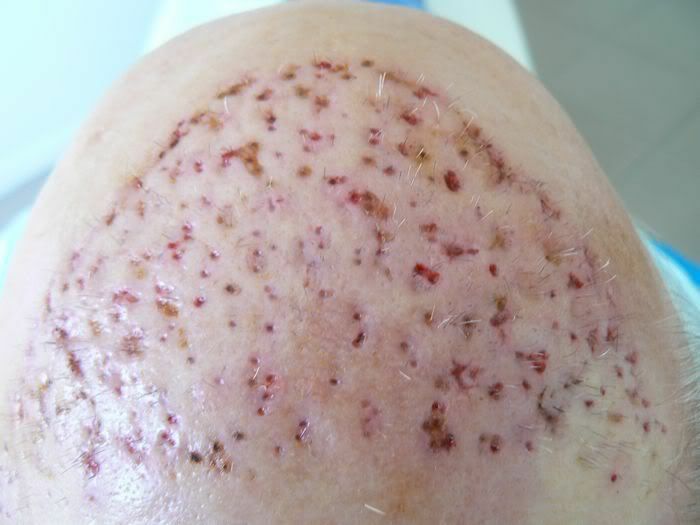 We removed the sutures and it could be seen the area is already starting to heal after only 5 days, it is clear how many of the FUE extraction sites are reducing in size as is the redness generally. 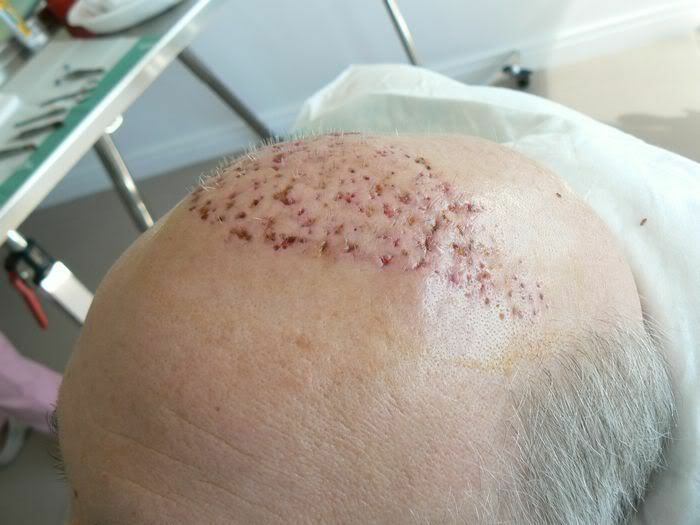 6 days post op healing pictures, every day an improvement in the look of the scalp, less pitting and pigmentation gradually returning to the norm. 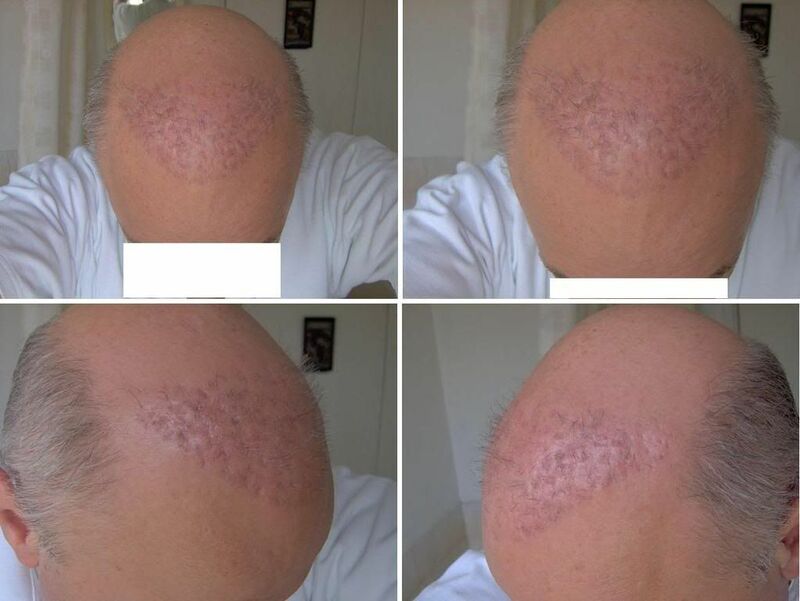 Here we have pictures sent by Dr Bisanga’s patient of his healing at 5 weeks post op plug removal. 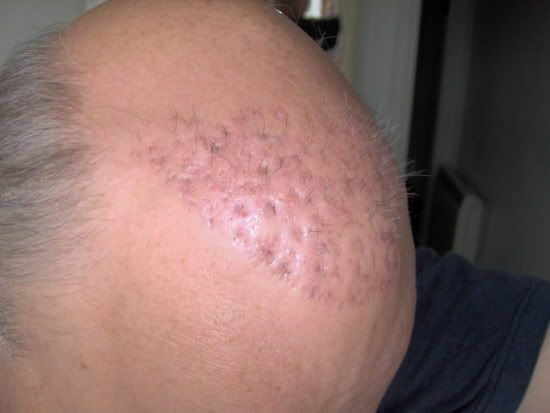 I think it’s possible to see the skin is beginning to relax, still a little redness in areas but on a positive note the pitting especially on the frontal hair line has improved a great deal. Still very early days. Many Thanks to Plug for meeting up with me and allowing me to take photos, your time was much appreciated! 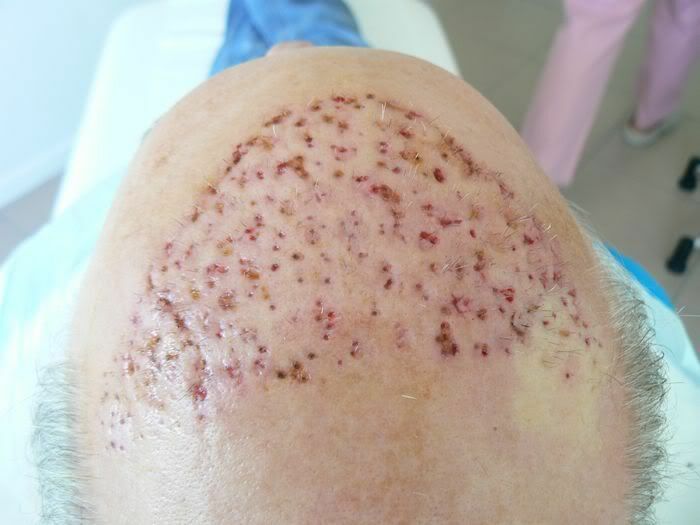 A round of dermabrasion or a peel of some sort on the transplanted area and he should be as good as new. Good work! » he should be as good as new. Good work! 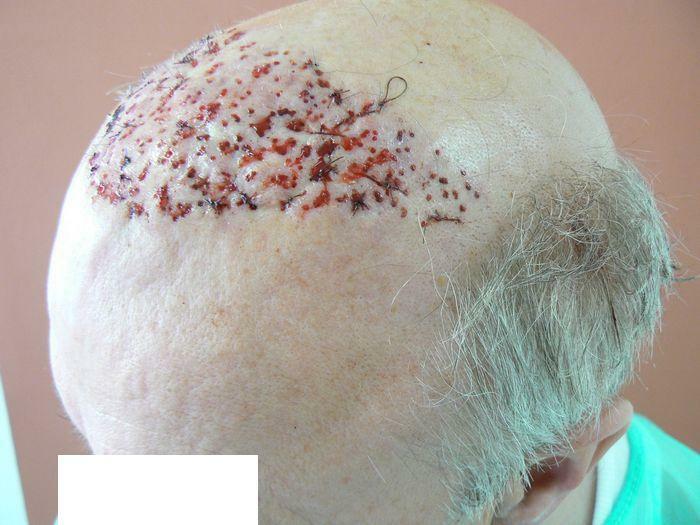 This is why, think twice before getting a hair transplant. 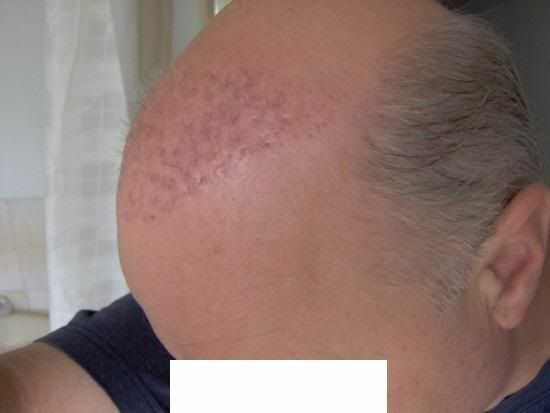 This is 100 times better but even after all the repair work you can still see traces of his old hair transplant plugs.